Brazil has long been a haven for movie piracy. A government study found that 41% of Brazilian internet users have downloaded content illegally from the internet. Piracy is also prevalent on the streets – with DVDs being openly sold in most commercial places and roads, and even outside movie theatres. The region was chosen for three primary reasons – broadband penetration was considered big enough as a market, incomes at the time were rising rapidly, and there was an appetite for Hollywood content. Netflix’s chief communications officer Jonathan Friedland says there was another important reason that facilitated their entry. „In Europe you have to buy individual content licences for every movie or TV show in each country, such as France, Germany or Spain,” he says. „If you offer good content at low prices and rapidly – releasing series in the same moment in Brazil as people are getting them in the US – that makes piracy less enticing,” says Mr Friedland. One of the key elements in its strategy is pricing. Netflix subscriptions in Brazil vary from 19.90 to 29.90 reais ($5 to $7.50; £3 to £4.60) a month. One movie ticket alone in Sao Paulo costs 30 reais ($7.50). For that same amount of money you can buy about 10 illegal DVDs in the streets, but the quality is not always reliable. And while many Brazilians illegally download films and TV shows, others are either not technologically savvy enough to do so, or are too concerned about computer viruses and malware. For commentator Sergio Branco, director at the academic think tank Instituto de Tecnologia e Sociedade do Rio de Janeiro, Netflix’s low prices is a key factor behind its success, making it more attractive to users than online piracy. Mr Friedland adds that when Netflix enters a country, the rates of internet file sharing drop. Retailerul online eMAG, de?inut de Dante International, estimeaz? vânz?ri de 205 milioane de lei de Black Friday, în 20 noiembrie, în cre?tere cu 24% fa?? de anul 2014, afirm? Iulian Stanciu, unul dintre ac?ionarii Dante International. PayU Romania se a?teapt? s? proceseze tranzac?ii de 450 milioane de lei în ziua de vineri, 20 noiembrie, declarat? de majoritatea partenerilor companiei Black Friday, a anun?at integratorul de tranzac?ii online. The share price low for the quarter was $437.39, meaning the new shares must have cost at least $1.1 billion. On September 30, the last day of the third quarter, Amazon’s shares were trading at $511.89, valuing Tiger Global’s stake at $1.63 billion. So far, Tiger Global’s bet has paid off. The stock closed at $647.81 per share on Monday, valuing the position at $2.1 billion. Asta se cheama sa ai o strategie. In cat timp poti face vanzari de 5 miliarde dolari? Alibaba said in a statement midday Tuesday (early morning in China) that gross merchandise volume through its payment service Alipay exceeded $5 billion in the first 90 minutes of Singles’ Day. 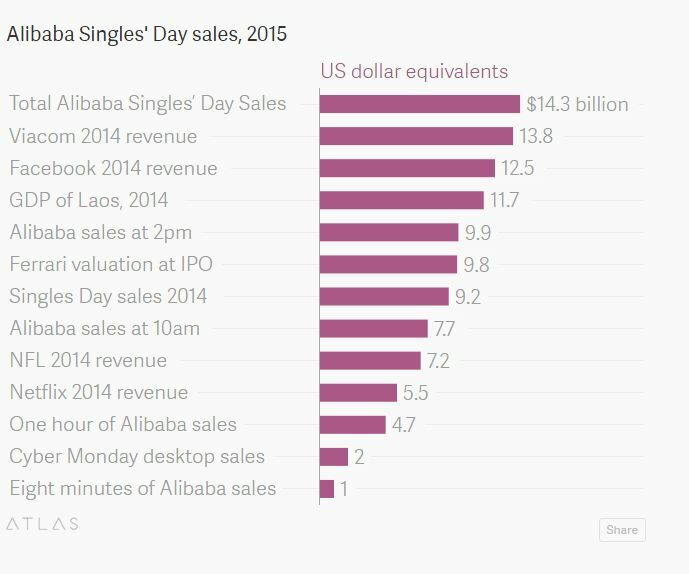 And more than 70% of that came from Alibaba’s mobile sites. Cresc investitiile clientilor in facebook, cresc si conversiile? For example, type “Cheap tickets to Rome, December 24” into Google and it means you’re looking to buy tickets. On Facebook or other social networks, however, few people show that sort of intent, because they’re not searching those sites for travel deals. With Facebook, a user could mention Rome, but that doesn’t mean they’re flying there on December 24. Ultimately, Booking.com would like to work with other partners to find ad products that pull that sort of specificity. Activision Blizzard va plati 5.9 miliarde USD pe King Digital, producatorii Candy Crush. Some perspective: Marvel: $4bn. Lucasfilm: $4bn. Minecraft: $2.5bn. King: $5.9bn.